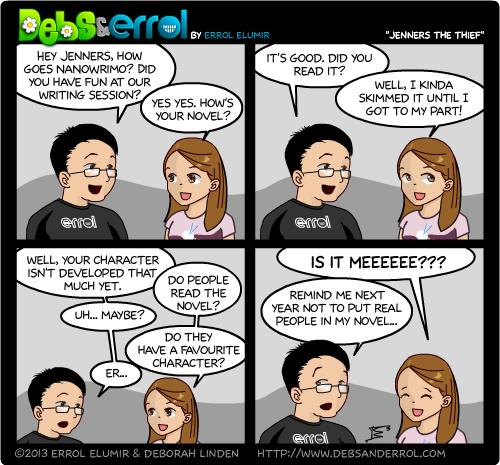 Errol: Yes, my nano novel is available for people to read. Yes, the knitting crew is in it, except Vix, who has now joined the knitting crew rather late. Poor Vix. I’m so behind on Nano. XDD I definitely won’t make the 50k… I think I’ll personally aim for 10k if I can. Is Jez the new MP? I’ve read some of Errol’s novel. It’s nice to have something funny to read during the stress of planning & writing my own novel. Kind of reminds me not to take things so seriously (even though my novel is mostly serious…doesn’t have to always be). And yes, the thief character is the least developed so far, though I am just past where she was introduced. Enjoyed what I read of Errol’s NaNo novel thus far- though be aware I will be suggesting additional encounters for you periodically, to help bring up your experience level (and because the random encounter is a staple of the genre).